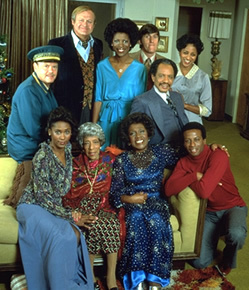 Formerly Archie and Edith Bunker’s neighbors on All in the Family, this sitcom follows the lives of African American couple George (Sherman Hemsley) and Louise “Weezie” Jefferson (Isabel Sanford). The sitcom begins as successful dry-cleaning businessman George and his wife leave the streets of Queens for the high-rises of Manhattan. Also living in their posh apartment building are Helen (Roxie Roker) and Tom Willis (Franklin Cover), an interracial couple who bigoted George refers to as “zebra.” The Willis’ lives become closely tied to the Jefferson’s when their children, Jenny Willis (Belinda Tolbert) and Lionel Jefferson (Mike Evans, later Damon Evans ) fall in love and marry. 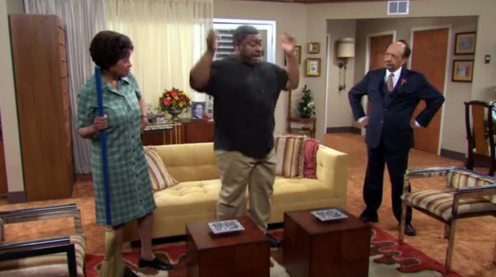 Short-tempered George often spars with his quick-witted housekeeper Florence Johnston (Marla Gibbs). He’s also often frustrated by ladies man Harry Bentley (Paul Benedict), a British United Nations translator with a bad back who often asks George to step on his spine. Good-natured Louise steers clear of most of the trouble but is often the target of jabs from George’s mom, Mother Jefferson (Zara Cull). The doorman of the building, Ralph Hart (Ned Wertimer), is rarely helpful and makes himself scarce unless there’s an opportunity to solicit tips from George and other tenants.